This two-bedroom home was the perfect solution for in-town living. It is built with structurally insulated panels for maximum energy efficiency, radiant heating, skylights and an attached garage. We recently completed an addition to a local church to be used as a food pantry. This 27' x 32' space was exactly what they needed to help many local families. It features french style double doors connecting to the church, a new deck area and a loading dock. A perfect way to entertain guests: their own spacious cottage right next door! A space-saving garage is located underneath the home, and the carefully laid-out living space is both functional and stylish. 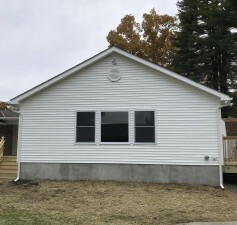 The cottage was constructed using SIPS (Structural Insulated Panels) for maximum energy efficiency, strength and durability, and the foundation was constructed with insulated concrete forms .. 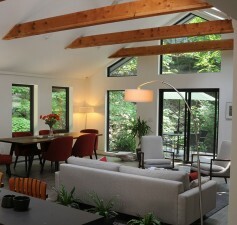 This unique cottage, set near a picturesque creek bed, makes it the perfect weekend retreat for a busy couple. 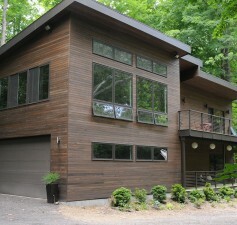 Its construction utilizes SIPS (Structural Insulated Panels) for maximum energy efficiency, strength and durability. The foundation was constructed with insulated concrete forms (ICF), the interior floor plan is open yet cozy, the well-laid out kitchen maximizes a small space yet is fun.. 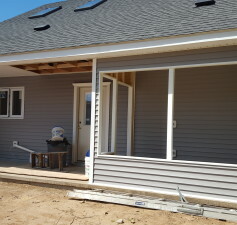 High-performance Insulated Concrete Forms (ICF) / Structural Insulated Panels (SIPS) house. 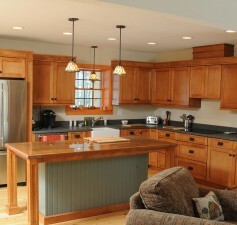 The cabinets were designed and built by a very talented local craftsman; the countertops and fireplace front are Pennsylvania polished bluestone; the flooring is wide-plank Michigan red pine; the white pine log siding is from a local log home producer; and the high-performance fireplace system is designed..